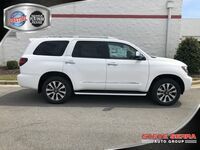 The Toyota Sequoia is the full-size Sport Utility Vehicle. This is a vehicle that is built to handle anything and everything life has in store. From carrying passengers and cargo, to carrying equipment, gear, and a crew, the Sequoia is designed to tailor to your needs and get the job done. 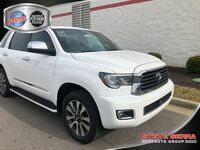 The Toyota Sequoia trim levels are all generously equipped. Plus, with the variety found within the trim spectrum, the Sequoia is easily customizable and can be suited to fit your individual specifications. This SUV has a generous amount of space in the cabin and in its cargo hold so you can be prepared for anything. The rear seats of the Sequoia can be folded down to make the vehicle even more cagro-friendly. Plus, the performance of the Sequoia will help move you forward. With enough power to tow the boat, the camper, or anything you need to haul, the Sequoia is incredibly capable. In addition, you’ll also find intelligent connectivity technology in the interior, as well as advanced safety and innovation throughout. Looking to get into a new vehicle, but don’t want to commit to buying? Try leasing! At Serra Toyota of Decatur, we are always updating our leasing pages. Leasing is a great way to update your vehicle without the commitment of purchasing. Lease terms are generally pretty short compared to the time you would own a car. This way, you can renew your vehicle every couple of years instead of keeping a car for a long period of time. This lets you stay up to date in the automotive market. Plus, leasing payments are generally lower than payments on a new vehicle, plus, the down payment isn’t as significant as when you buy. 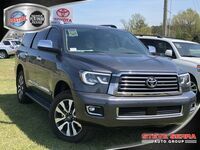 Come see us for more information on new Toyota Sequoia lease offers in Decatur, AL.